THERE are fears for a 10-week-old puppy after it was stolen from Bundaberg RSPCA in the early hours of Saturday morning. Animal attendant Nicole Murgatroyd said the male puppy, they named Bullet, was surrendered to the shelter with his brothers and sisters on Friday. It was then stolen from the Dolbo St facility at 2.45am on Saturday. She believes the culprit may have known the layout of the animal centre. "It came in with a litter of six and wasn't even here for 24 hours," she said. "We have CCTV footage which shows they (the offenders) came through the back." Ms Murgatroyd said they feared for the safety of the pup. "We just want the puppy back," she said. "Our fears are he may not be in a safe home or have food or water." Bullet is microchipped and has only had his first vaccination. 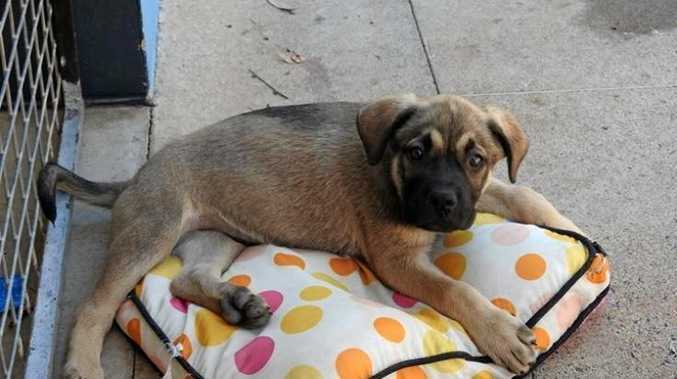 Local vets have been notified to keep an eye out for the stolen German shepherd cross English mastiff. It's not the first time a dog has been stolen from the centre. In August last year three bull-mastiff pups worth more than $400 each were stolen. At the time Bundaberg shelter manager Karina Taylor said she was shocked at the brazen break-in. Ms Taylor pleaded with the thieves to return the dogs, who were showing signs of kennel cough. They were later recovered through the help of social media. If anyone has any information they can phone the shelter on 41551736 or Policelink 131 444.